Physician assistant students on the Path of Distinction in Public Health helped organized the program’s annual service-learning trip to Belize. Before enrolling in the UW Physician Assistant (PA) Program, Elizabeth Lucht spent 15 years as a clinical social worker—an experience that made her keenly aware of the healthcare disparities facing people of color, people who live in poverty, and people with severe mental illness. Rebecca Flax worked in Central and South America during and after college, and was an AmeriCorps health educator at a Boston community health center. Brian Vike, a native of rural Wisconsin who spent childhood summers on his family’s dairy farms, first realized the role of public health in disease prevention while an undergraduate at UW-Madison. Their life experiences differ, but these students all share a desire to incorporate public health into their training and careers. They are among 15 PA students who have enrolled in the Path of Distinction (PoD) in Public Health, a UW School of Medicine and Public Health (SMPH) program that more deeply integrates public health principles into the PA curriculum. The PoD in Public Health is part of an SMPH initiative called Public Health and Primary Care Innovations in Medical Education (UW-PRIME). Supported with a five-year, $1.5 million grant from the U.S. Department of Health and Human Services’ Health Resources and Services Administration (HRSA), UW-PRIME cultivates PA and MD students who will incorporate health promotion and disease prevention into their practices. In addition to curricular enhancements and the creation of the PoD, the initiative will lead to MPH dual-degree programs for PA and MD students. PA students on the PoD choose from global health, community health, or rural health tracks, and complete coursework, service-learning experiences, and a capstone project related to that track. For example, Lucht, who is on the global health track, visited a health care center in rural Rwanda. This March, she and four other PoD students will complete a four-week rotation at a rural clinic in Belize. The rotation is an expansion of the PA Program’s annual service-learning trip to Belize—a trip that also inspired Rebecca Wachowiak, who is on the community health track. Global health track student and Iraq veteran Jonathan Lacore has had extensive experience providing medical care overseas. He and several classmates helped organize last year’s Belize trip, an effort that naturally complements the global health course required by the track. Coursework also came full circle for Vike, who is on the rural health track, after completing two rural health electives that culminated in farm tours. For these students, career plans include primary care or emergency medicine practice coupled with public health efforts that are as individual as they are. Flax, a National Health Service Corps Scholarship recipient, plans to enter primary care practice in a qualified Health Professional Shortage Area. 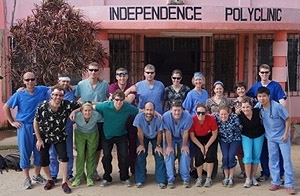 Lacore aims to practice here at home, volunteer in clinics abroad as often as possible, and develop community health education initiatives on childhood obesity. Lucht is interested in advocacy and education to address healthcare disparities in people with mental illness. Vike would like to practice in western Wisconsin and advocate for the food quality, physical activity and overall health of the community he serves. Wachowiak hopes to return to Belize and the communities she served as a student, and conduct public health-oriented research as a practicing clinician.